Shealy Molpus is a native of Mississippi. 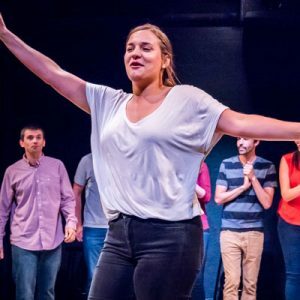 Since moving to D.C., she has lost some of her accent but gained a great love for improv. Shealy has long admired the many hilarious ladies of the improv world. She finally mustered up the courage to give it a whirl after moving to D.C. in 2015 and hasn’t looked back. Shealy is a graduate of Washington Improv Theater’s training program. Additionally, she plays with the indie trio Special Friends and has performed in WIT’s Fighting Improv Smackdown Tournament and Improvapalooza. Shealy’s a lover of all foods, but especially foods that are noodle-y. (She also has a dog named Noodles, whom she loves more than life, sweet life, itself.) She’s an internet scavenger and a meme queen with an arsenal of GIFs that is unparalleled. Don’t believe her? Hit her in the DMs, and she’ll show you what’s what. "Girl who will flip her eyelids inside out if you pay her a quarter"